“We talked,” the narrator tells us, “about what it would be like when we returned home,” but the awful truth is that a return becomes impossible. This November, we’re celebrating the first full year of the Asymptote Book Club. Over the last twelve months, the Book Club has brought its subscribers newly-translated fiction from twelve different languages, taking readers on a journey from the Arctic Circle down to the forests of Bengal, from the Ottoman Empire at the end of the nineteenth century to Bangkok in the postmodern era. For our November Book Club selection, we’re excited to be showcasing one of the most powerful novels written since the independence of Croatia: a breathtakingly original coming-of-age story set in the aftermath of perhaps the most shocking massacre in recent European history. 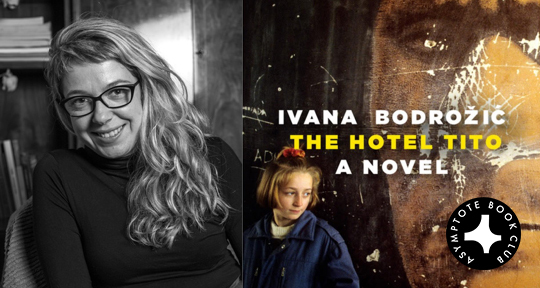 For more information on Ivana Bodrožić’s The Hotel Tito, published in English by Seven Stories Press, read Assistant Managing Editor Jacob Silkstone’s review below or head to our online discussion group. If you’re not a Book Club member yet but would like to join us as we head into our second year, all the information you need is available on our Book Club page. Literature, according to Ahmet Altan, is our best method of confronting “the dark and bloody face of history.” The Hotel Tito, which follows the first volume of Altan’s Ottoman Quartet as an Asymptote Book Club selection, spotlights a particularly dark and bloody episode of Europe’s recent past. Its chosen method of confronting history is no less courageous for being characterised by an impressively original subtlety and a surprising lightness of touch. While the earliest novels about the Yugoslav Wars (Slavenka Drakulić’s As If I Am Not There perhaps foremost among them) seethe with raw energy and anger, Bodrožić’s equally harrowing stories are interspersed with moments of humour: the comedy serves to enhance the tragedy. The Vukovar massacre was perhaps the most brutal event of the Croatian War of Independence. In her afterword to The Hotel Tito, translator Ellen Elias-Bursać explains that “When the army broke the siege [of Vukovar] . . . people came up out of the basements where they’d been sheltering from the shelling; women and children were allowed out . . . but the army took some four hundred men prisoner at the Vukovar hospital and bused them to the Ovčara farm on the outskirts, where soldiers and Serbian paramilitaries massacred the hostages over several days.” The hostages, Bodrožić’s father among them, were senselessly slaughtered in groups of ten or twenty—their partial remains discovered a year later in a mass grave. What it means is six years in exile, and the deaths of both her father and her paternal grandfather. Her father remains “missing” throughout the period—from 1991 to 1997—covered by the novel, leaving the family in a state of legal and emotional limbo, while Grandfather stays behind in Vukovar during the siege and has his throat slit. The narrator, together with her mother and older brother, become “displaced persons” (“we were displaced persons, the ones from Bosnia were refugees”) and are accommodated at “the old political school complex” in Tito’s birthplace, Kumrovec. For eight months, they live “without a single dinar, except the displaced-person allowance.” Despite a series of increasingly desperate letters to the Croatian Ministry of Defence, and even to the President, their legal status remains unchanged for more than half a decade. “We talked,” the narrator tells us, “about what it would be like when we returned home,” but the awful truth is that a return becomes impossible. “Never such innocence again,” as Larkin wrote in the aftermath of another conflict. Bodrožić’s fictional self is all too easy to identify with. Like virtually every other teenager, her day-to-day world consists of a series of frenetic struggles for social and sexual status. With her friend Marina, she “[lights] candles every afternoon for the late great Kurt Cobain”, and during the novel she has her first cigarette, her first drunken night out, her first kiss . . . The ongoing war changes everything and nothing. In the English version of the novel, Ellen Elias-Bursać deserves particular credit for keeping Bodrožić’s narrator and the frequently eccentric cast of supporting characters every bit as funny as they must be in the original. Jokes about the difference in the Vukovar and Zagorje dialects are rendered without difficulty, and Croatian puns are expertly transformed into English puns. At least in translation, The Hotel Tito bears an unexpected resemblance to JG Farrell’s Troubles: in both, a crumbling hotel plays host to the outlandish lives and loves of multiple characters, with violent conflict casting a constant shadow somewhere near the back of the stage. It’s easy to see why The Hotel Tito has been described as “the most powerful Croatian novel written about the war of the 1990s”: it may be light both literally—at 160 pages, it belongs somewhere in that shadowland between novella and novel—and tonally, but it packs a heavy punch. Read an excerpt of Hotel Tito here, first published in our Spring 2016 issue.